not sure about size, guessing around sz. 6 to a sz. 10 in little girls. UMMI & Ms LaGlenda are CELEBRATING!!! and get the MEGA SUPREME package for only $595!!!! Mega Grand Will Drive Away In A New Car! UMMI Is Looking For You!!! July 21-23 Atlantic Sweethearts in Harrisburg, PA.
AMERICA'S REGAL GEMS HAS NO EXTRA FEES FOR SUPREME TITLES. YOU ARE ELIGIBLE FOR ALL SUPREME TITLES FOR ONE LOW ENTRY FEE OF $325 (SUPREME PKG BEAUTY & 3 OPTIONALS). FIRST 10 CONTESTANTS TO CONTACT ME FROM THIS AD WILL RECEIVE AN ADDTIONAL OPTIONAL FREE..
"OVER $25,000 IN PRIZES WILL BE AWARDED AT THIS EVENT"
MAPS - 3 ULTIMATE SUPREME WINNERS (GLITZ) WILL RECEIVE A GORGEOUS CROWN, SATIN EMBROIDERED SASH AND $150 BOND. ENTER ALL GLITZ SYSTEMS BY MAY 1, 2006 AND RECEIVE THIS SPECIAL FREE. YOU MAY ENTER AFTER THIS DATE FOR A FEE OF $25. MAPS - 1 GRAND SUPREME WINNER (NATURAL) WILL RECEIVE A GORGEOUS CROWN, SATIN EMBROIDERED SASH AND $100 BOND. ENTER ALL NATURAL SYSTEMS BY MAY 1, 2006 AND RECEIVE THIS SPECIAL FREE. YOU MAY ENTER AFTER THIS DATE FOR A FEE OF $20. ENTER BY APRIL 30, 2006 AND ENTRY FEE IS ONLY $250 PER SYSTEM. Awarding Bonds, Gorgeous Crowns, & Gifts Galore! Mega Grand Drives Away in A New CAR!! 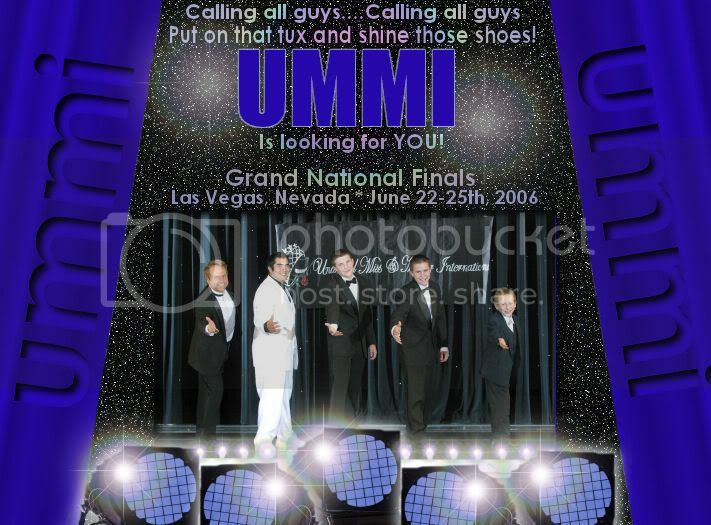 UMMI Grand Finals in Vegas! DRIVE AWAY IN A NEW CAR!!!! Over 80 Titles to be Won! 4 Queens/Kings per age division! We offer a Professional Production ~Organized ~ Honest ~ Fun and Fair competition ~ Awarding Over $75,000 in Cash and Prizes ~ Fun for the whole Family ~ Awards Banquet ~ We DO NOT Play the name Game or cater to ANYONE ~ We will have MANY Qualified judges from All over the United States (many different opinions) ~Anyone can walk in and WIN! ~ Score Sheets given following Crowning ~ No one walks away empty handed, we have great gifts for ALL contestants. IN A BRAND NEW CAR!!!! 1 ~ Mega Grand Supreme Drives wins a New CAR! Every contestant will receive a Tiara and/or a Special Gift! Join Patsy's at UMMI in Las Vegas!!! If You're Not in Patsy's, Where Are You? UMMI Photo Contest * Going on NOW! to the 2006 Grand Finals! Winner per age division receives $200 CASH off 2006 International fees! 3 ~ Grand Supreme (0-4) (5-10) (11 & up) Ca$h on Stage! 1 ~ Supreme Beauty Ca$h on Stage! 1 ~Supreme Talent Ca$h on Stage! 1 ~ Supreme Model Ca$h on Stage! Registration Friday Evening 6:00pm. - 10:00pm. ~*~Want $1000 CASH? !~*~Come and get it, at Southeast Universal Miss and Universal Faces Mini National! ~Mini National Photo Contest!~SE UMMI/FACES Mini National Photo Contest! Everyone will receive fees of the mini national! MAPS - 3 ULTIMATE SUPREME WINNERS (GLITZ) (0-3, 4-8, 9 & UP) WILL RECEIVE A GORGEOUS CROWN, SATIN EMBROIDERED SASH AND $150 BOND. ENTER ALL GLITZ SYSTEMS BY MAY 1, 2006 AND RECEIVE THIS SPECIAL FREE. YOU MAY ENTER AFTER THIS DATE FOR A FEE OF $25. You will receive your $350 via Paypal or Cashiers Check!!! PLUS.....other great gift items to be awarded!!! CLICK ON BANNER TO......ENTER TODAY!! LET'S DOUBLE IT IN APRIL!! First 5 entries are � price!!! Our family wants to say a big THANK YOU to everyone who entered our first benefit photo contest, and raised almost $100 for Erin's Fund (erinsfund.org)!!!! We are so grateful for the support of the people of New England, and now the pageant community!! Thanks again so much, and congratulations to Katie Easler for being the March GRAND SUPREME!!! DUE TO NEW SYSTEMS BEING ADDED TO NEPS ALL SYSTEMS WILL ACCEPT DOOR ENTRIES. LET US KNOW YOU PLAN TO ATTEND AND LATE FEE WILL BE WAIVED. ANYONE ENTERING AT THE DOOR WITHOUT PRIOR NOTIFICATION WILL BE CHARGED A LATE FEE. NEPS - 3 ULTIMATE SUPREME WINNERS (GLITZ) (0-3, 4-8, 9 & UP) WILL RECEIVE A GORGEOUS CROWN, SATIN EMBROIDERED SASH AND $150 BOND. ENTER ALL GLITZ SYSTEMS BY MARCH 10, 2006 AND RECEIVE THIS SPECIAL FREE. YOU MAY ENTER AFTER THIS DATE FOR A FEE OF $25. NEPS - 1 GRAND SUPREME WINNER (NATURAL) WILL RECEIVE A GORGEOUS CROWN, SATIN EMBROIDERED SASH AND $100 BOND. ENTER ALL NATURAL SYSTEMS BY MARCH 10, 2006 AND RECEIVE THIS SPECIAL FREE. YOU MAY ENTER AFTER THIS DATE FOR A FEE OF $20. The UMMI Family Congratulates You! Celebrating 20 years of Excellence in Pageantry! where the Mega Grand Will Drive Away in a New CAR! BONDS MAY INCREASE or MAY BE PRORATED DEPENDENT UPON PARTICIPATION. TAKING ADVANTAGE OF OUR EARLY BIRDS!!! CLAYTON CUTIES, H&M BY MICHAEL BACA. FEBRUARY 24TH - Photos and payment must be received. Winners notified by 28th February. MARCH 17th - Photos and payment must be received. Winners notified by 21st February. the deposit requirement of $100 due by date indicated (10 March 06). Early Bird Special Grand Supreme Package Discount! Mega Grand Supreme will win $1000 CASH and $200 off UMMI Internationals in VEGAS. PLUS many more titles and prizes to be awarded!!! Luau Saturday Night!!! Not just for the kids, Mom and Dads come join the fun with our Limbo Contest - you too can go home with prizes!! Enter NOW to win fees off. Winners will also be featured in our program book!!! This is a WIN/WIN situation!!! SE Mini National where someone will walk away with $1000 CASH!! Who Wants a New Car!! Want to win a Return to Tiffany's necklace? In the little blue box? 3 Anniversary queens will!!! Don't Miss Out On These Great Pageants &Fun Contests &Fabulous Services!!! Want to add your LINK???? 65 NATIONAL QUEENS AND KINGS. EVERY CONTESTANT WILL WIN A TITLE. Online Adsystems Is 2005 The Final Crown Affiliated. Earn Your Points With Us Today!! Don't Miss Out On These Great Pageants & Fun Contests & Fabulous Services!!! ENTRIES ARE VERY LOW.. IF YOU PLAN TO ATTEND YOU NEED TO CONTACT US ASAP. AMERICA�S REGAL GEMS WILL AWARD ONE LUCKY WINNER A PRIZE PACKAGE OVER $2000 INCLUDING A STUNNING 10� AMERICA�S REGAL GEMS CUSTOM BUCKET CROWN. AWESOME AWARDS. ALL WINNERS RECEIVE CUSTOM CROWNS & CUSTOM SATIN EMBROIDERED SASHES. OTHER PRIZES INCLUDE DVD PLAYERS, JEWELRY, TOYS, DOLLS, BRATZ, CAMERAS, HUGE STUFFED ANIMALS, SAVINGS BONDS AND SO MUCH MORE. WE NOW HAVE A PRIZE TABLE WHERE YOU CAN PICK YOUR OWN PRIZE IN ADDITION TO ANY TITLE PRIZES. NO ONE GOES HOME EMPTY HANDED. LOTS OF PRIZES FOR EVERYONE. LOTS OF FUN AND EXCITEMENT. FREE MOM & DAD PAGEANT. MARK YOUR CALENDAR TO JOIN US FOR THIS EVENT. WE PROMISE YOU WON�T BE SORRY YOU DID. REMEMBER: There are NO hidden fees. Your Supreme Package fee of only $325 makes you eligible for all supreme titles. Enter by February 20, 2006 and receive one event FREE plus you will be entered into a special Amethyst Supreme. The winner will receive a custom crown, custom sash and a pretty amethyst bracelet. You may also enter our Combined Overall Grand Supreme Title for only $20. Three lucky winners 0-3, 4-8, 9 & up will receive a gorgeous huge crown, satin sash, and $250 savings bond. Don�t forget America's Natural Beauties & Perfect Pearls Natural Pageant on Sunday, March 12, 2006. Enter America�s Regal Gems and America�s Crowned Royalty and you may enter this pageant for $25. If you choose to only do America�s Natural Beauties & Perfect Pearls pageant your entry fee will be $35. This is a natural pageant and open to girls, boys, women and men of all ages. Great prizes and gifts for all. (1) Free Cover entry, (1) Free Centerfold entry! $50 off Grand Package or $25 off any other package! First entry in each division gets choice in line up! YOUR HEIGHT in free raffle tickets! * Home Theater surround sound speaker system! * Snap set swimming pool! * And other one of a kind prizes! Come join these Oklahoma beauties! Click Banner To Bid Now! LA BELLE FILLE WILL BE THERE!! YOU COULD WIN $350 CASH!!! BOOK YOUR COMP DESIGN SLOT NOW!! MODELING CARDS..........WEB DESIGN/MAINT, AND MORE!! AMERICA�S REGAL GEMS WILL AWARD ONE LUCKY WINNER A PRIZE PACKAGE OVER $2000. AWESOME AWARDS AND PRIZES FOR EVERYONE. REMEMBER: There are no hidden fees. Your Supreme Package fee makes you eligible for all supreme titles. Send your applications by January 30, 2006 to receive each Supreme Package for only $250. That's a total of $500 for both National Pageants! PLUS enter both pageants by this date and you will be eligible for an ADDITIONAL Overall Grand Supreme Title for FREE! THAT'S NOT ALL! If you enter both ACR & ARG by Jan. 30th, you will receive all the above PLUS entry into America's Natural Beauties & Perfect Pearls BEAUTY ONLY, Natural Pageant on Sunday, March 12th for FREE!